Have you ever seen a Holiday Home Tour with an unmade bed and laundry? Well, you’re about to! Cleaning a house with two toddlers here 24/7 is dang near impossible, let alone decorating and staging one for a home tour, so this is the least staged home tour you may see today. 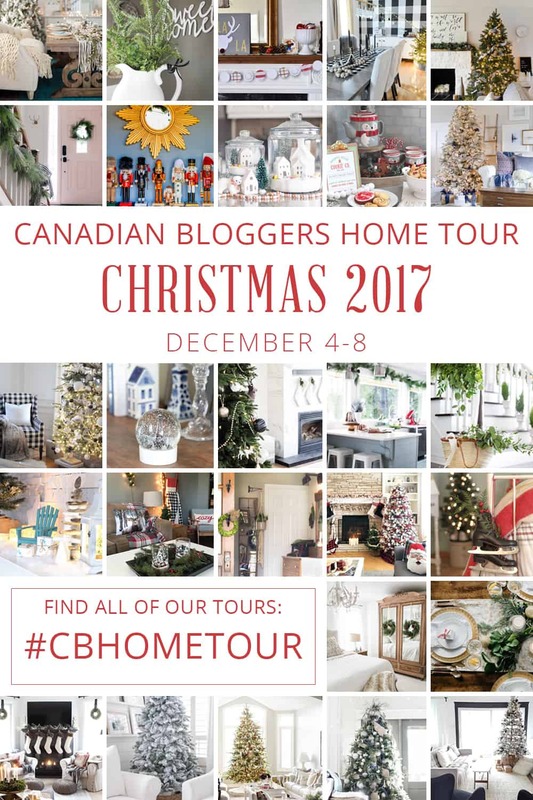 Speaking of which, I’ve partnered with some amazing Canadian bloggers to show you how we’ve decorated our homes for the holidays, and you’ll want to keep your eyes peeled the rest of the week too because there will be more every day this week! You might remember this entryway from the One Room Challenge, and if you want to see a bit more, check out the reveal post! The dining room is also fairly new, and you can look for a post with tips on how I painted this buffalo check wall coming soon! Other than the tree, I added several wreaths, because if I can’t decorate a Christmas tree (thanks to 2-year old toddlers), I WILL put up all the wreaths. In the kitchen, I added some more greenery and a wreath on the window above the sink. A simple faux pine branch in a vase on the island and a mini tree by the coffee maker, and we’re done. The living room also has a tree with no decorations and a few cute things on the mantle. I think this year it’s a lot more about Winter decor than Christmas decor. Are you ready for the messy bed and laundry? There you have it, you guys. Real life with a dash of Holiday decor. Now make sure you head over to see all of the other Holiday tours happening today. You can bet I’ll be hopping over to see what beautiful inspiration these ladies have! Love this!!! Keeping it real is what it’s all about. For years I had to decorate around a dog who would eat things off the tree and tables! I love your home Thalita! And every single room you’re redesigned, lol. I love seeing how you decorate it all. It’s all stunning :) I’ll take some inspiration from you for next year! That buffalo check wall is amazing! I just love your style! I loooooove everything about your Christmas home Thalita! It’s real, fresh and so pretty! I especially LOVE your pink door with the wreath…I need a pink door now. This is gorgeous! You did such an amazing job! So pretty Thalita. Thalita this is such a perfect balance of seasonal and regular decor – love it! Happy holidays! I just love your home so much. It’s so chic but still comfortable and inviting. Gorgeous job! Oh, the laundry! Never-ending. But your home looks fresh and pretty and clean. All the touches of green are so lovely! Thalita! I love you Christmas home! So crisp and fresh and bright and welcoming and cozy!! Thanks for the tour – fun to be on this hop with you! Greenery is an all-time fav of mine when it comes to Christmas! Love what you’ve done with the space.